Philly DA Larry Krasner announces new guidelines to reduce city's reliance on probation and parole. More than 42,000 Philadelphians are on probation — more than three times of people on probation in NYC. 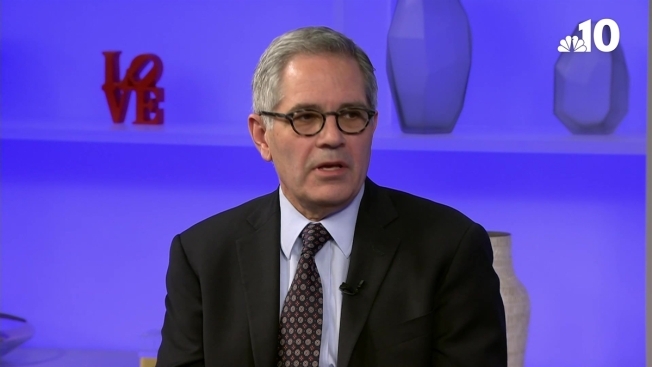 “These new policies are an effort to end mass supervision, which is a major driver of mass incarceration, and bring back balance to sentencing,” Krasner said. Philadelphia District Attorney Larry Krasner is issuing guidelines to reduce the city's reliance on probation and parole. The new rules will be carried out at the discretion of attorneys and judges and seek supervision terms averaging 18 months for felonies. Philadelphia has more than 42,000 people on probation. By comparison, New York City has 12,700 citizens on probation. Philadelphia District Attorney Larry Krasner is focusing on a new set of priorities heading into his second year in office — ending the number of people on probation and parole. His new guidelines, unveiled Thursday, echoed similar changes enacted during Krasner’s first year. His office is already seeking shorter sentences and moving away from cash bail for low-level offenses. "When people are supervised for too long, they tend to fail," Krasner said. "They lose their jobs, they commit new crimes and we don't need new crimes." The new policy directs assistant district attorneys to seek supervision terms averaging 18 months with a cap of three years for people who committed a felony. For misdemeanors, the recommendation will be six months probation or parole, not exceeding one-year combined supervision. The guidelines, however, are just recommendations. Lawyers and judges will have the discretion to make exceptions when appropriate. Moving forward, Krasner said his office hopes to cut the number of people on supervision "by the thousands," including people who are currently in the criminal justice system and showing progress in their rehabilitation, the district attorney said. Last year, Philadelphia had roughly 42,000 people on county supervision compared to just 12,700 in New York City, according to the district attorney’s office. That translates to roughly one out of every 22 adults on supervision at any given time, Krasner said. Pennsylvania, meanwhile, has the highest number of people under parole or probation in the Northeastern United States. Across the nation, Georgia has the highest number of people under supervision. "To me that's just stunning," he said. "It does not make us safer." North Philadelphia resident Khalif Jones agrees. He was first arrested at the age of 17. While he was in prison for a second offense, Jones received his GED and later met a probation officer who helped him get his life back on track. Now, he helps others going through the criminal justice system and says rehabilitation should be better incorporated into the overall approach. "You release someone from prison and you want them to feel free," he said. "But how am I free if every time I turn around, you're looking to throw me back in?" Currently, someone involved in a minor case might be sentenced to serve three months to 23 months behind bars, plus an additional two years of supervision. That translates to nearly 50 months of total supervision, including time served, for a low-level offense, Krasner explained. And under Pennsylvania law, probation can last as long as a prison sentence. "That is how Pennsylvania got to the be state in the United States that has the worst level of excessive parole," he said. "And frankly, I don't think that's how we should think about ourselves." Research has shown that probation and parole sentences lose efficacy after two years, the district attorney’s office said. Thirty-seven states across the country have already reduced their supervised populations while at the same time lowering rates of recidivism, the office added. Krasner aims to do the same. North Philadelphia resident Khalif Jones experienced the system first-hand after he was first arrested at the age of 17. While he was in prison for a second time, Jones received his GED and later met a probation officer who helped him get his life back on track. Now, he helps others who have been incarcerated and says rehabilitation should be better incorporated into the system. Krasner painted a picture of what excessive supervision can do to a non-violent offender. That person might incur bail and court fees, plus wages lost while serving time, plus a potential fallout from employers if too much work is missed. If that person then misses appointments with a probation or parole officer, then they could easily land back in prison, Krasner said. It's that kind of cycle La Colombe owner Todd Carmichael sees too frequently. As a local business owner in one of the most incarcerated cities in the country, several of Carmichael's employees are embroiled in the criminal justice system, he said. Carmichael has also spent time in jail, he added. He was first arrested in college during a political protest and was arrested again a few more times after that. Those experiences showed him how hard it can be to pick up the pieces and start over, he said. "I don't see any winners in this oversight process that we have," he said. "It's not anyone asking for a second chance ... it's someone not wanting their one chance taken away." Krasner has come under fire in recent weeks for being soft on crime as the number of homicides in Philadelphia soars above Chicago's, which has long toiled with a high murder rate. But the district attorney's approach to criminal justice will take time to manifest, and it could be some time before the city sees positive effects, he said. "In any social movement that is seeking change ... at first they, frankly, take you for granted and then they make fun of you and then they fight you," he said of detractors. "But that's a good sign. That means we're getting stuff done."